Harlem is in the grip of a crime wave, with councilwoman-turnged-gangster Mariah Stokes Dillard orchestrating things from behind the scenes. The police can't touch her and all Luke Cage can do is put out fires and try to fight crime on his own (whilst dealing with his own social media fame). Events take a turn for the worse when a Jamaican criminal named "Bushmaster" arrives, hellbent on vengeance against the Stokes family. 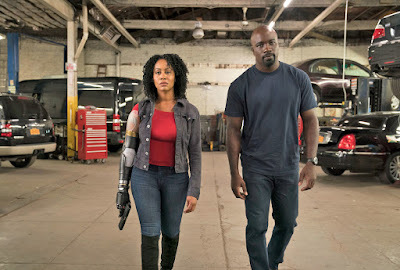 The first season of Luke Cage may rank as the weakest of the Marvel/Netflix collaborations so far (despite strong competition from the first season of Iron Fist): an excellent first half, with a strong villain (Mahershala Ali's Cottonmouth) giving way to an absolutely awful second half with a weak antagonist (Erik LaRay Harvey channelling William Shatner levels of ham in his one-note performance as Diamondback), with maybe seven or eight episodes' worth of plot stretched over thirteen hours. Season 2 of Luke Cage, annoyingly, manages to take these problems and magnify them. The season is far from a complete write-off, with the actors all being great and some of the storylines and character arcs having promise, but none of it cohering very well. The villain problem is at least alleviated, with the always-splendid Alfre Woodard stepping up as Mariah and Mustafa Shakir (The Night of, The Deuce) giving a charismatic performance as the ridiculously-named Bushmaster. The show also adds some good new acting talent in the form of Reg E. Cathey (The Wire) as Luke's father. Sadly, Cathey passed away shortly after filming of the season was completed. But the negatives are huge. This time around there are maybe four episodes' worth of plot stretched across thirteen hours. Not just entire episodes, but entire blocks of episodes simply exist to spin their wheels and take neither the plot nor the characters anywhere. It doesn't help that the writers seem to not be on the same page as one another: in early episodes Luke apparently has an anger problem, but this immediately vanishes and is never mentioned again. In another episode recurring secondary villain Shades (Theo Rossi) appears to have genuine remorse (to the point of crying about them) for the deaths of innocent civilians he's caused, and in the next is gloating maniacally about them. Claire Temple (Rosario Dawson) is just dropped from the season when the writers run out of things for her to do. The first episode has a great joke about villains always trying to shoot Luke when they know he can't be hurt, which is undercut by the same thing happening again and again throughout the season. There's also a team-up with Danny Rand/Iron Fist (Finn Jones) which is surprisingly great, but then Rand just disappears from the story with no explanation. There's a lot of frustration here, mainly because the actors are great when they're given good material to work with, but all too often they're left going round in circles and talking about things we already know about ad infinitum. As a 4-6 episode mini-series, the second season of Luke Cage (**) could have been excellent. As a 13-hour season, it's an all-too-often soulless grind, with bright moments separated by hours of tedium. Easily the weakest season of the Marvel/Netflix collaborations to date. The season is available now on Netflix. I agree on this. I'm most of the way through the series, and dragging on the last 2-3 episodes. My frustration with the Netflix/Marvel series is that with the exception of Jessica Jones season 1, the bid-bad is always someone who can punch harder than the hero. That gets boring after a while, no matter how you spin it.